If you know excess weight is keeping you from a healthy, active life, Beacon Health System can help you take the first step toward permanent weight loss. Our weight management programs offer a range of choices for both medical and surgical weight management. Bariatric surgery is a life-changing option that offers hope for people considered more than 100 pounds over their ideal weight, with a body mass index of 40 or more. Our thorough evaluation process helps us select candidates for surgery who are fully committed to making diet, exercise and lifestyle changes for a lifetime. Our patients who have had a bariatric surgical procedure commonly report improvements in their quality of life, social interactions, psychological well-being, employment opportunities and economic status. Let us guide you step by step as you pursue a healthier lifestyle. We provide a comprehensive approach to weight loss. We offer surgical and non-surgical options and a broad range of education, evaluation and support services to create a plan that’s right for you. Board certified surgeons – In addition to board certification in general surgery, our surgeons have additional training and expertise in bariatric procedures. Team approach – Our doctors partner with you and our expert team of nurse practitioners, bariatric nurses, dietitians, exercise experts and psychologists to provide you with the tools you need to succeed. Individualized care – We spend time getting to know you and help you create a care plan that addresses your goals and unique situation. Long-term support – We offer extensive education, ongoing support groups and long-term follow-up to help you manage your weight successfully. 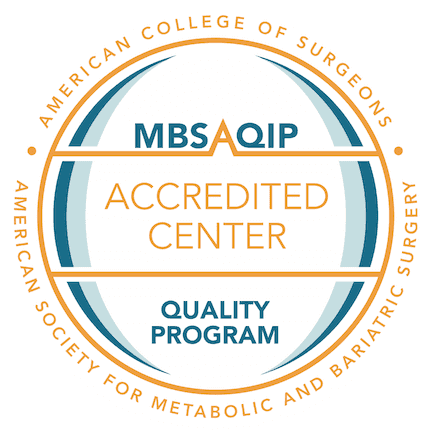 Elkhart General Bariatric Surgery Center is accredited by the Metabolic and Bariatric Surgery Accreditation and Quality Improvement Program (MBSAQIP), a joint project of the American College of Surgeons and the American Society for Metabolic and Bariatric Surgery (ASMBS). MBSAQIP accreditation means you have access to a comprehensive and multidisciplinary program, not just a surgical procedure, which improves patient outcomes and long-term success.